What products do I promote? How do the products I’m promoting contribute to my overall sales plan? I have 5,000 stores, how much inventory of each promoted item should I stock at each store? Stockouts directly result in lost revenue opportunities, through lost product sales. This could be a result of customers who simply purchase the desired item from another retailer—or a different brand of the item. Overstock results in costly markdowns and shrinkage (spoilage) that impacts margin. The opportunity cost of holding non-productive inventory in-store also hurts the merchant. And if inventory freshness is a top priority, poor store allocation can impact brand or customer experience. Since retailers invest margin to promote products, inefficient promotion planning can be a costly exercise. It’s vital to promote items that drive the intended lift. Rubikloud’s Price & Promotion Manager allows merchants and supply chain professionals to take a holistic approach to integrated forecasting and replenishment. The product has three core modules detailed below. Learn module: Leverages machine learning to understand how internal and external factors impact demand at a store-sku level, as well as a recommendation framework to improve future planning activities. Activate module: Allows non-technical users to harness the power of machine learning to better forecast demand and seamlessly integrate forecasts into the supply chain process. Optimize module: Simulates expected outcomes by changing various demand-driving levers such as promo mechanics, store placement, flyer, halo and cannibalization. The module can quickly reload past campaigns to automate forecast and allocation processes. 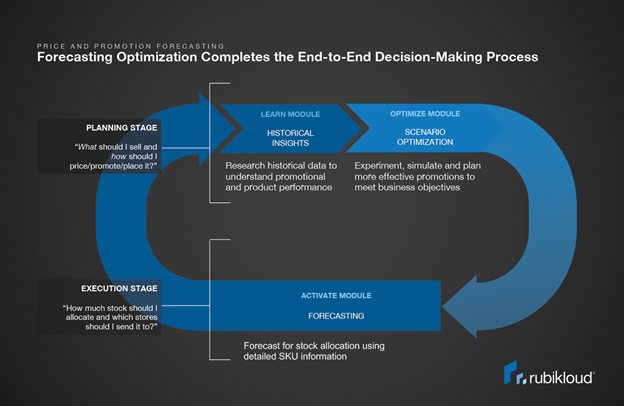 In addition, AI automates decision-making across the forecasting lifecycle. The retail-centric approach to forecasting applies novel solutions to more accurately forecast demand. For example, to address new SKUs, the solution uses a new mapping approach to address data scarcity and improve forecast accuracy. The Price and Promotion Manager solution is built on a cloud-native, SaaS data platform designed to handle enterprise data workloads, covering all aspects of the data journey from ingestion, validation, to transformation into a proprietary data model. Users can seamlessly integrate solution outputs into their supply chain processes. The product design recognizes the challenges faced by category managers and enables a more efficient planning process (for example, a quick view to YoY comp promotions). Addresses data sparsity introduced by new product development and infrequently purchased items to better predict demand through new SKU mapping. Translates stacked promotions and various promotion mechanics to an effective price, to better model impact on-demand. Uses hierarchical models to improve forecast accuracy. HDInsight: allows Rubikloud to work faster and to have full confidence that they are taking advantage of every possible optimization. Cosmos DB: provides the convenience of an always-on, reliable, and accessible key/value store. Also provides a reliable database service. Blob Storage: easy to use and integrates well with HDInsight. Azure Kubernetes Service (AKS): uses the power of Kubernetes orchestration for all Azure VM customers. Explore how Price & Promotion Manager enables AI powered price and promotion optimization for enterprise retail.